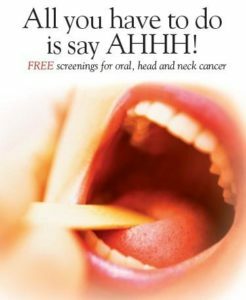 Hoag Cancer Center, One Hoag Dr.
Board Certified otolaryngologists, oral surgeons and dentists will be providing complimentary oral cancer screening at Hoag Family Cancer Institute, Saturday 4/21/18. Contact the Cancer Center at 949-7-CANCER for further details or registration. Oral, Head and Neck screening clinic for persons who do not have regular access to dental and medical care.